ProLon® is Fasting with food. ProLon® is a 5-Day Meal Programme that nourishes your body through scientifically developed, plant-based foods, while supporting regenerative and rejuvenating changes. THE 5 DAY MEAL PROGRAMME THAT IS CLINICALLY PROVEN TO PROMOTE HEALTH AND LONGEVITY. ProLon® provides the body with healthy, plant-based ingredients that have been scientifically demonstrated to deliver optimal nourishment while not activating the key pro-ageing pathways including the growth hormone, insulin and Insulin-like Growth Factor (IGF-1) pathways activated by normal diets. These hormones signal to the body that it has consumed significant levels of carbohydrates and proteins and can activate genes that accelerate the growth pathways, which also speed ageing and block regeneration/rejuvenation. ProLon® is the first Fasting Mimicking and Enhancing Diet that provides you with a combination of foods and ingredients able to reprogramme the body into a regenerating and rejuvenating mode, resulting in long-term reduction of IGF-1, glucose and markers of inflammation and ageing, but only in subjects with high levels of these markers. Cellular entry into a high protection and stress resistant mode. Removal of damaged cells and tissues. Self-repair through cellular regeneration and rejuvenation. ProLon® ingredients are plant-based and do not contain any additives, preservatices* or chemicals. The daily calorific intake with ProLon® is between 750 and 1,100 calories from healthy ingredients that maximise nourishment and provide a pleasant eating experience. 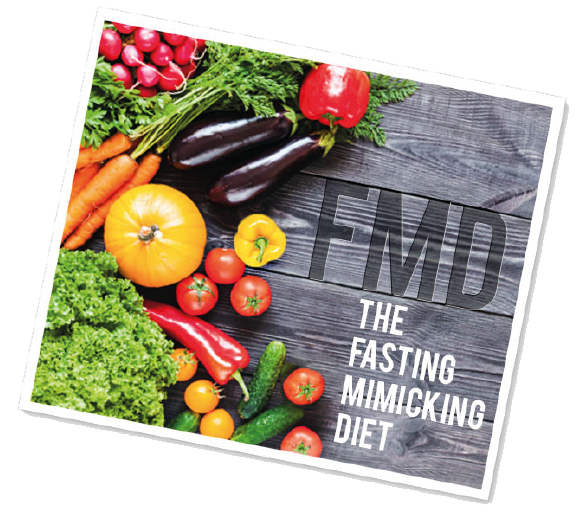 The Fasting Mimicking Diet, or FMD, is the first meal programme made of healthy natural ingredients that you consume for five days, during which your body does not recognise that it is eating and therefore remains in a fasting mode. In simple terms, it is fasting with food! This nutiotional breakthrough was scientifically developed and clinically tested at the Longevity Institute at the University of Southern California. 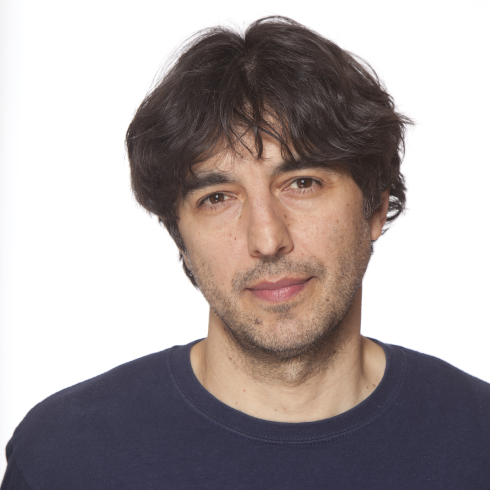 Let by Prof. Valter Longo, the USC Longevity Institute unites multidisciplinary ageing research approaches in order to enhance Human Helath span, the healthy part of life. Prof. Longo is the Director of the Longevity Institute at University of Southern California and the inventor of the Fasting Mimicking Diet (FMD) nutritechnology. He is considered by many to be the global leader in nutrition and ageing. Professor Longo discovered 20 years ago that two out of the three pathways caused cellular ageing. His research team then embarked on a journey to uncover an impactful intervention that slows or reverses biological ageing in order to delay the onset of age related chronic diseases. If you think about it, if Alzheimer's disease, Diabetes type 2, most cancers and most cardiovascular diseases appear at later age in life, it is because ageing is the catalyst of these diseases, and therefore optimizing the way we age increases Healthspan, the healthy part of human life prior to disease onset. Professor Longo then proved that periodic fasting, done for several consecutive days, is a very powerful intervention that our body learned to naturally cope with by protecting and rejuvenating itself, both anti-ageing measures. Because it is difficult and risky nowadays to fast on water only, Professor Longo, under the sponsorship of the National Institute of Health, National Cancer Institute, and National Institute on Ageing, has developed a natural plant based meal program named Fasting Mimicking Diet (FMD) which imitates fasting while feeding the body. Professor Longo's work has been published in top scientific journals like Cell, Nature, Science, Journal of Translational Medicine, and covered by top global media like CNN, FOX, BBC, New York Timesm Washington Post, etc. ProLon® Is now available in our Clinics! The ProLon® dietary program required guidance from a healthcare provider, such as a dietitian or nurse practitioner, for healthy individuals or a physician for individuals at risk for side effects or presenting certain diseases. 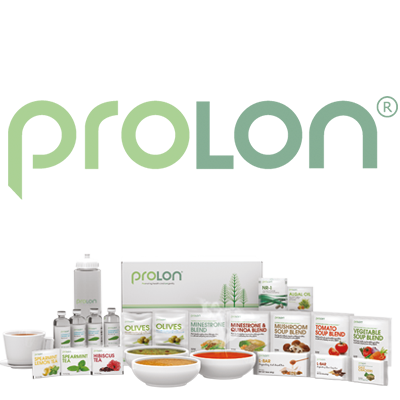 Who should engage in the ProLon® dietary program? ProLon® was shown in clinical trials to have beneficial effects on a wide variety of markers: it decreases abdominal fat while increasing relative lean body mass, decreases fasting glucose, reduces C-reactive protein (a marker of inflammation), and reduces IGF-1 (associated with increased DNA damage mortality and ageing in humans). What does a "Fasting Mimicking" Diet mean? 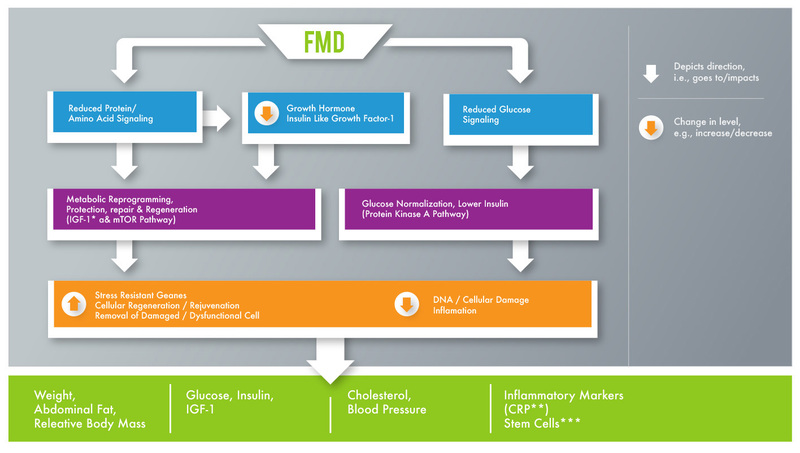 A Fasting Mimicking™ Diet (FMD™) is a high nutrition, low protein, low carbohydrate meal plan, clinically proven to beneficially change a wide range of biomarkers associated with ageing, poor health, and inflammation. (See Question 2). How much weight does one lose and will the individual be able to keep it off? Once the patient starts the ProLon® cycle can they split up days? Is there a 'Transition Day' diet for the patient after completing the ProLon® diet? Is there scientific data to prove the ProLon® dietary programme allows patients to reach a "fasting state"? Is there scientific data supporting ProLon® ingredients and formulation? Are all the components of the diet considered organic? The meal plan contains some products that are made with organic ingredients, but they are not certified organic. Our food products are all plant-based. What other foods can be consumed while on ProLon®? What can patients do if they are very hungry during the 5 days? Can coffee be consumed while on ProLon®? Because coffee can interfere with the beneficial effects of the diet, it is not recommended to be consumed with ProLon®. However, for those who cannot go without, we recommend minimising coffee consumption to 1 cup per day. Can different flavours of tea be substituted while on ProLon®? If all the food is not eaten for the day, is it ok? What if one meal is missed, can it be taken later on the same day? Can the diet be stopped at Day 4? The diet is formulated based on specific nutritional, scientifically proven benefits. Therefore, it’s very important to follow the diet closely. However, if this happens on one occasion, do not worry —continue with the ProLon® dietary programme for the rest of the 5 days. What are the options if certain ProLon® food items are disliked? Can fresh herbs be added to the soups? What is the energy drink for? What is the energy drink made from? What is it in the food that makes it "anti-ageing"? 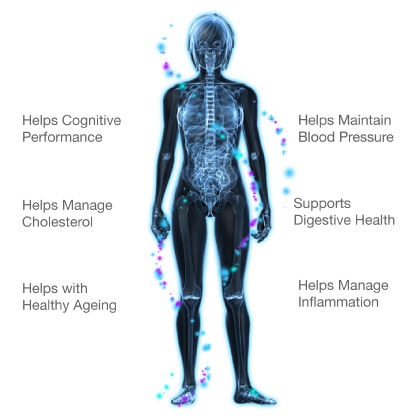 ProLon® is the first and only Periodic Fasting Mimicking Diet and is scientifically developed, and clinically proven to induce a fasting state which optimizes metabolic health and decreases age-related risk factors. The rejuvenation effect is the main reason why ProLon® followers lose fat very quickly while preserving lean body mass (muscle and bone). Can I participate in this programme if I have a history of allergy or may be gluten - or lactose - sensitive? ProLon® Fasting Mimicking Diet is Lactose and Gluten Free. Participants with food allergies such as nuts, soy, tomato, or with any other known allergies to the ingredients, should avoid consuming ProLon® or wait until a version of ProLon® is produced that is free of allergens. What is the recommended "healthy" or "normal" daily calorific intake? We recommend you discuss your ongoing diet with your GP. They can review your current intake and give you specific guidelines to follow based on your height, weight and gender. During the 5-Day ProLon® dietary programme, approximately 1100 calories are consumed on Day 1 and 750 calories on Days 2-5.